Two men fleeing for their lives after a troubled night but are unable to get home. An all-female jazz band broken down on the road accept help from a creepy couple. A man finds himself having to do all he can to save a life. A brother will stop at nothing to rescue his sister. A family threatened whilst on vacation. 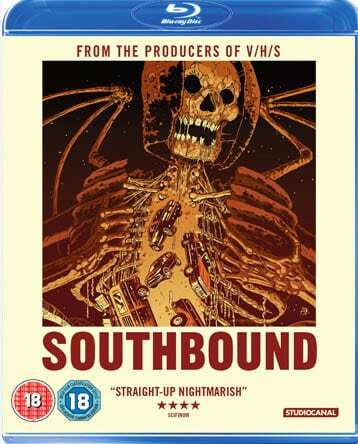 These five interlocking stories set on a desolated Southern highway make up horror anthology SOUTHBOUND, a nightmarish film from those behind popular horror anthology title, V/H/S. Unlike V/H/S, SOUTHBOUND connects its tales of terror together much tighter than we’re used to with each story flowing neatly into the next. With the sound of genre favourite Larry Fassenden’s DJ keeping our characters company via the radio, we get the feeling that all is not quite what it seems on this routeless stretch of highway. The first set of characters we’re introduced to are a pair of men who’ve obviously had a bad night as they drive, covered in blood, down the highway and decide to stop off at a diner. They appear to be chased by spooky black spectres hovering in the distance, creatures that are quietly terrifying to look at. Their desperation as they try to out run these things, that are seemingly appearing from every direction, is plain to see and it doesn’t appear that escape is a valid option. The subtle special effects of these ‘beings’ works extremely well and whilst we get to meet these disturbing creatures up close and personal, they’re much more frightening as spectres in the distance. This goes to prove that you don’t always need to see things in major detail to send the chills down a viewer’s spine. The other stories link off this first tale, one by one flowing into the other, giving the viewer more of an idea on what this location is – fucked up, that’s what!! Misery is behind every corner but there’s also unanswered questions which leave the viewer intrigued with the various plot points of each segment. For the most part it’s riveting stuff and never is there a point where the film loses your attention – quite the opposite, in fact. The various stories conjure up the idea that this never-ending highway in the middle of nowhere is purgatory of some sorts or at least a ride to hell which many won’t be able to get off. It’s exciting to watch play out because you don’t know how the story will end for each of the individuals who take this road and, unlike V/H/S, each of the five segments in SOUTHBOUND are pretty strong with a cast to match. 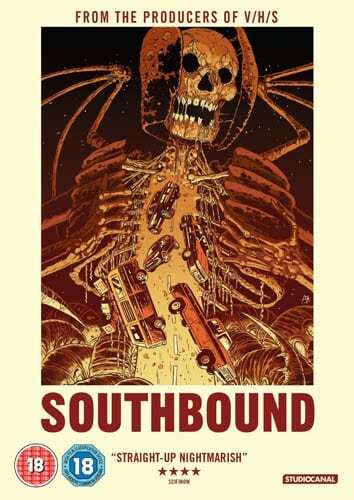 Though it’s by no means perfect, I do believe SOUTHBOUND is one of the better horror anthology films out there with its understated brilliance and nightmarish atmosphere far surpassing that of the likes of V/H/S. It’s quite a short movie at 85 minutes long but quality over quantity is definitely a factor to be admired here. Though already a strong output, there’s so much more that could have been explored from this particular highway location that in many ways I feel the film has merely scratched the surface. I love how this eerie setting allowed my imagination to wander and conjure up other horrors that may have been lurking behind each highway stop off. The possibilities are endless! Couple that with the film’s atmospheric vibe which mimics that of John Carpenter’s In The Mouth of Madness makes this movie a winner in my eyes. SOUTHBOUND offers up something short and sweet that is definitely worth sampling.